Getting to Perth was painless and our arrival made up the Magnificent Seven flotilla of Port Seton (2), Anstruther (2), South Queensferry, Dunbar and Porty. Our crew consisted of the following fine athletes ; myself, Nik, Barbara, Claire, Alex and Stan. Launching at the sea cadets jetty gave little room for manoeuvre, but it was efficiently done, with 35 potential lifters for each boat. Once the rescue boat was fired up, we were off, in blazing sunshine. A perfect start to the day. Rather than take 2 crews, we opted for 1 crew and a ‘spare’ and took it in turns to sprawl out in the bow ‘nest’ of jackets, packed lunches etc. This trip has two distinct halves. The first follows a fairly narrow stretch of river, which was flowing, but not that fast and a good depth, even towards the banks. This gave us all time to take in the views that you don’t normally see from the motorway. 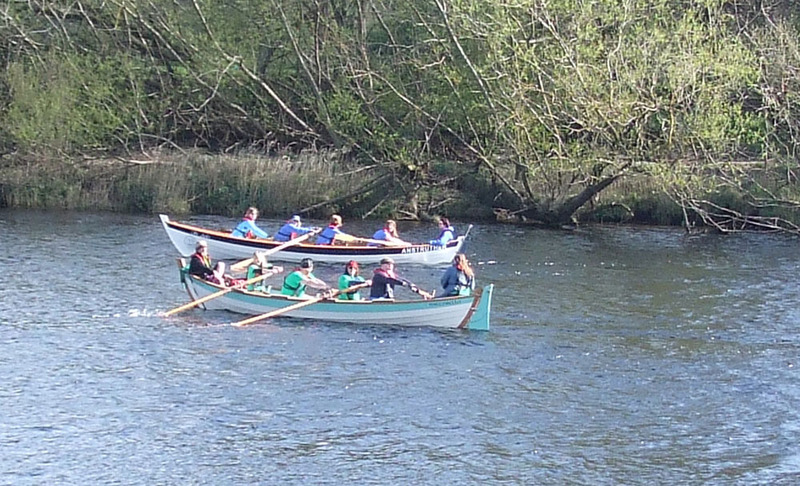 If you forget about trying to row in time – which this crew managed easily (! ), then it’s possible to enjoy the scenery and the impressive stately homes and curious follies up on the hills that this trip offers. It also allows for a bit of seal spotting with the seals coming surprisingly high up the river. Once we settled into our style, the crew came into their own. Despite only guest appearances at rowing these days, Nik demonstrated he’s still a man to watch, by rowing effortlessly in stroke oar for ages, without a bead of sweat. That is, in between fag breaks. Just under 2 hrs later, Newburgh was in sight. We landed on a slipway, to be greeted by a foot of sludgey mud under the water. Nae luck to those wearing the short wellies ! Once on dry land, we were treated to a viewing of the Newburgh boat which was drying in the sunshine and has just about got all its planks on. The team there have an excellent base in what looks like a derelict farm building. So, we should be seeing that boat on the water soon. The lunch stop was leisurely, but we were in the hands of the tide, so we relaunched through the squelch and were off again. After a generous lunch, both Claire and Barbara tried in vain to introduce ’10 hard ones’ into the proceedings, to pick up the pace, but the crew were having none of it. 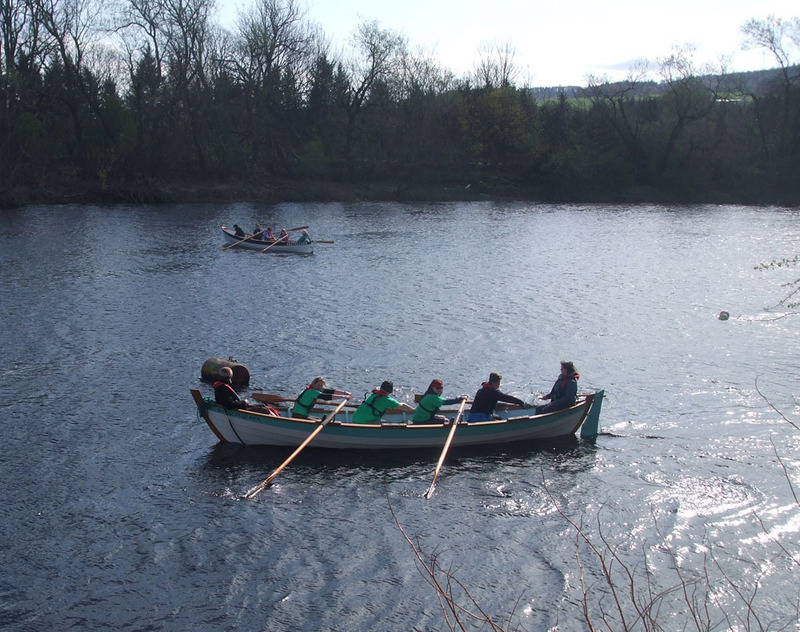 In fact, it was at this stage that we showed the versatility of the Porty crew, by swopping our traditional pole position for one, several boats lengths behind the rest of the flotilla. On a number of occasions, with darkness falling and the tide receding, Andrew from Port Seton cranked up the engine on the rescue boat and towed us along so that it looked like we were still part of the same trip. We were way behind! Ha ha….FACT ! Okay, so by mile 12, we were flagging a bit. 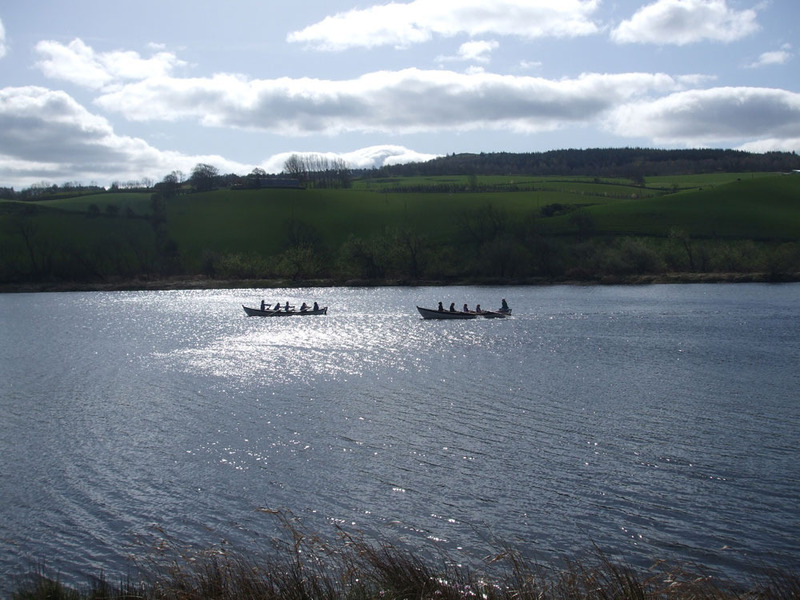 Shortly after Newburgh, the river widens out into a Firth and the conditions become more sea like and the rowing slightly harder. It is at this point that you experience what can only be described as ‘The Tay Bridge Disaster’. Let me explain….the get-out for this trip is just after the Tay rail bridge, which is visible in the *distance* and hours later….it is STILL in the distance and even when you think you are getting close….it’s nowhere near – hence the label ‘the Tay Bridge Disaster’.Possibly even an April fool. However, we persevered and enjoyed clear views of Dundee in all its glory . It looks so much prettier from the water — sorry, Dundee. 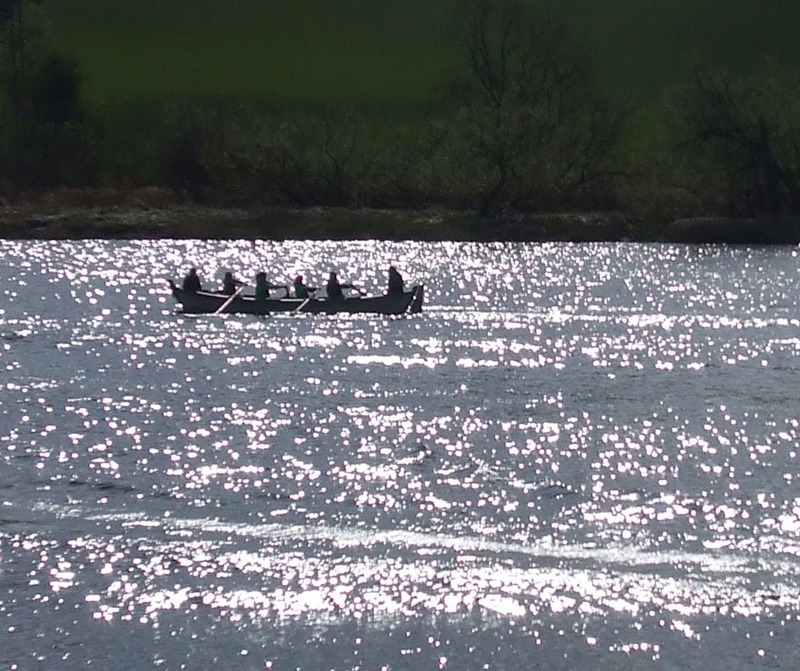 18 miles later and all a bit dazed, we had reached our destination before darkness fell and with enough chop and a tiny wee slipway to aim for, coxing to the finish line was a bit of a challenge. If you notice charred marks on oar no 3, this is because Alex must have been feeling the burn. Fuelled mainly by a wee tin of oily oysters (yes, tin — and yes, oysters!) eaten with his fingers, Alex rowed and rowed and rowed, refusing all offers of a rest. Only the promise of chips was enough to persuade him to surrender his oar because we had- in fact- arrived at our destination and it was time to STOP. Well done, that man. Another one to watch. On dry land again, we were greeted by a very welcome hot cuppa, courtesy of the Wormit Sailing Club and we all congratulated each other on reaching the finish line in what was an epic row — particularly the last few miles when the waves and the wind had picked up. I really hope some of you get the chance to do this row for yourselves. It’s an interesting one. But, we still had to load up the boat….There followed a bit of trailer-ballet as Stan demonstrated his ability to reverse it all around a harbour and still manage to get it nowhere near our boat. Quite an achievement really ! However, he did show his skill at being able to reverse closer to lots of other things, like within a foot of the pier edge and more impressively within inches of the Port Seton boat — you should have seen their startled faces. 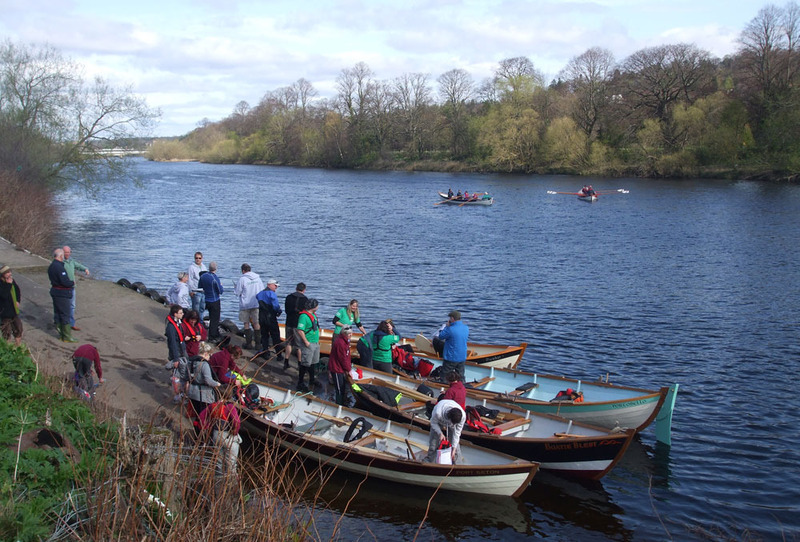 Boatie Rows lives to see another regatta – just ! Big thanks to all the crew. Don’t take any of my sarcasm personally, you all made it great. Stan, you were a legend from start to finish, so big thanks and I hope your chicken dinner was worth the wait.